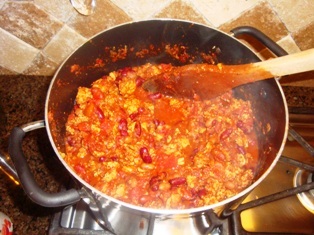 Looking for How to Make Homemade Chili With Meat using a Pressure Canner - Easily! With Step-by-step Directions, Photos, Ingredients, Recipe and Costs in 2019? Scroll down this page and follow the links. And if you bring home some fruit or vegetables and want to can, freeze, make jam, salsa or pickles, see this page for simple, reliable, illustrated canning, freezing or preserving directions. There are plenty of other related resources, click on the resources dropdown above. How to Make Homemade Chili With Meat using a Pressure Canner - Easily! 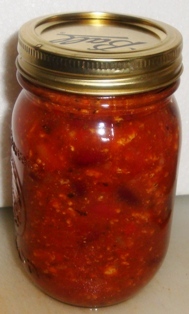 Making and canning your own Chili Con Carne is easy and safe with this recipe. It closely follows the USDA's tested recipe for safety, and I explain what you can modify safely! 3 lbs ground beef, chicken, turkey , venison, etc. Modifications You can substitute the spices. 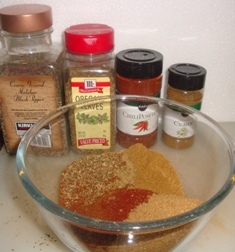 For example, You could add 1 tablespoon of Tabasco sauce or other hot sauce, add a couple more tablespoons of chili powder (or use less). 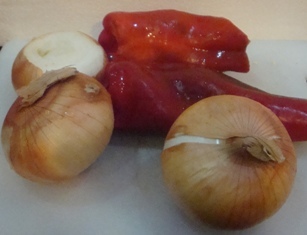 You can reduce or omit the onions or peppers, but don't add more of them. 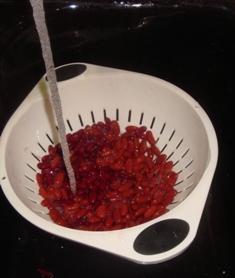 Wash beans thoroughly and place them in a 2 qt saucepan. 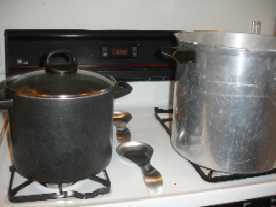 Add cold water to a level of 2 to 3 inches above the beans and soak 12 to 18 hours. Drain and discard water. 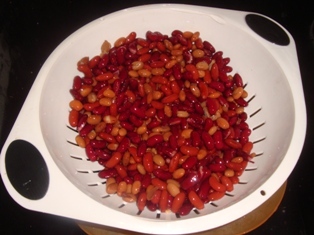 OR use drained, rinsed canned beans. 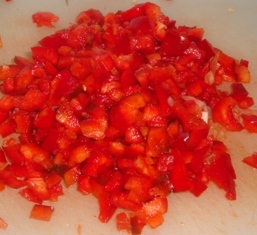 I dice the onions and peppers into small pieces, about 1/4 inch (1/2 cm), and the tomatoes I leave in larger pieces, around 1 inch (2.5 cm). 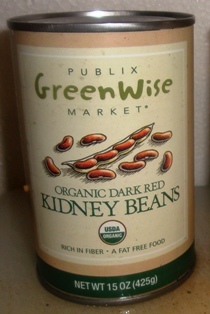 Combine the beans with 5-1/2 cups of fresh water, and 2 teaspoons salt. Bring to a boil. 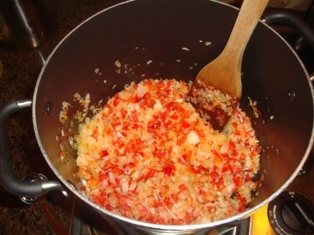 Brown the chopped onions and peppers in a pan with 1 tablespoon of vegetable oil, if needed, to avoid burning! 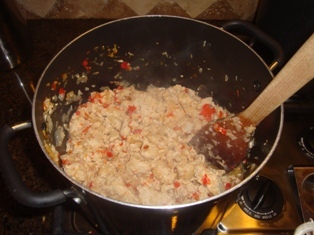 Now, brown the meat (ground beef, ground chicken or ground turkey), along with the chopped onions, and peppers, (the onions and/or peppers are optional), in a skillet. Drain off the fat (I put it in a colander or sieve and let it drain in a pan in the sink). Put the pot back on the stove and add the spices. 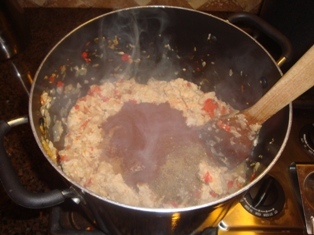 Put the drained, cooked beans and the drained browned meat in a large pot. 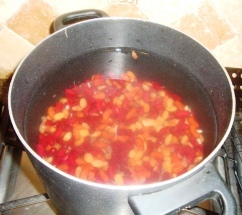 Add the, lemon or lime juice and the drained, cooked beans. Simmer for 5 minutes, so everything is heated thoroughly. Caution: Do not add starch or other thickeners. Fill the pint jars (larger jars are not allowed, but smaller are), leaving 1-inch headspace. 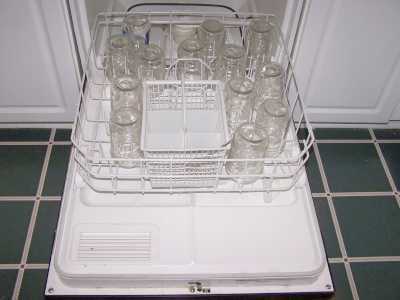 Adjust lids and tighten the bands, gently, by hand. Once the gauge hits 10 or 11 pounds (depending on the type of canner , see the tables below), start your timer going - for 75 minutes. Adjust the heat, as needed, to maintain 10 or 11 pounds of pressure. Note: the chart at right will help you determine the right processing time and pressure, if you have a different type of canner, or are above sea level. 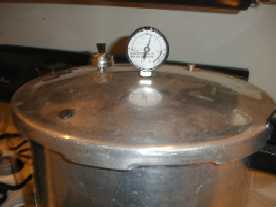 Recommended process time for Chile Con Carne in a dial-gauge pressure canner. 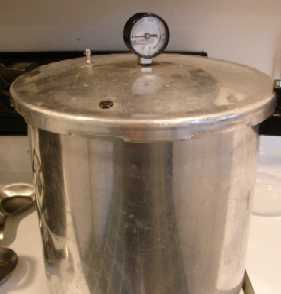 Recommended process time for Chile Con Carne in a weighted-gauge pressure canner. Thank you, I made and canned your chili recipe yesterday evening, 28 pints, just waiting to try it. The sample going into the jar tasted really good. I just done it with beef to let the grandsons try it if they like it I am going to make it with their venison in a week or two. I am thinking of maybe mixing venison and beef. Thank you for all that you do!! !